This week's Artisan Design Team blog hop features the projects that were shown on Stampin' Up! 's facebook page last week. Thanks for coming by from Wendy's blog , if you didn't see her project yet, make sure you go back and check it out - she does such great work! 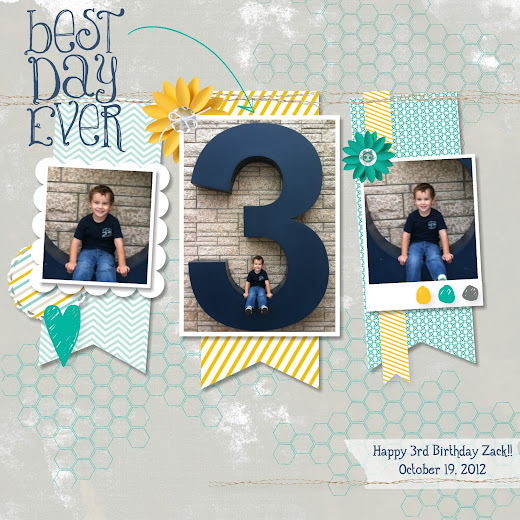 For this My Digital Studio scrapbook page I used the Lemonade Stand digital content CD from the Sale-a-bration brochure. I love the trendy, fresh images and the great paper color combos of the Lemonade Stand CD. Also, this is one of my favorite pictures of Zack ever! The 3 is so huge and he looks so cute sitting on it. It was a perfect picture for his 3rd birthday. Thanks for joining us this week! Please continue on to Cindy - she's got a gorgeous card to show you. Great page! I think you just inspired me to get the SAB and Lemonade Stand discs in my order next week! Awesome page! Whereever do you find such a large number?? ?